Have you ever had egg in your coffee? That's just insane ... or ingenious? If you are having coffee in the morning, why not slurp down breakfast as well? Vietnamese Egg coffee, or Ca Phe Trung or Cafe Trung, is a Northern Vietnamese drink. I’m from South Vietnam where egg coffee is not prevalent as the North. In fact, I never heard of such a drink until I saw a documentary on Hanoi. I immediately tossed down the remote, leaped off the couch and ransacked the kitchen for three simple ingredients: Coffee, condensed milk and egg. This drink is similar to the cappuccino. You have it hot and instead of milk foam, you have egg foam. The egg yolk is whipped together with condensed milk until light and frothy. The frothy mixture is then added to brewed coffee. Who would have thought to add egg to coffee?! The drink is rich, creamy, and … breakfast. Those crazy Northern Vietnamese. You got to love them. 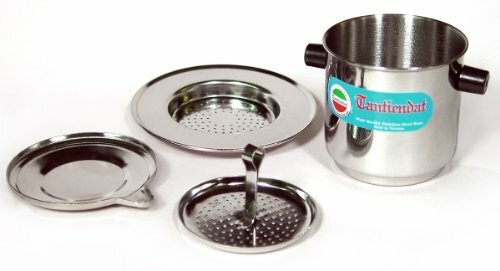 Using a Vietnamese single-cup coffee filter called a Phin, brew your favorite brand of coffee and set aside. Whip the egg yolk with condensed milk until you get a frothy and fluffy mixture. Slowly pour the frothy mixture on top of your brewed coffee. If you want to make coffee the Vietnamese way, use the Phin for brewing. The phin is a single-serving coffee filter that sits on top of a cup. You can purchase the phin on Amazon. Add the Vietnamese coffee filter on top of a cup. There's a wide circular base that goes directly on top of the cup. Then the cylindrical well goes on top of that. Insert the pressed (the piece with the vertical handle) on top of the coffee grounds. Make sure to pack down the grounds. Add hot water inside the well, filing it up to the top. If you don't have enough room to add all the water required in a recipe, wait a few seconds for some of the water to run through the well. Then add the rest of the water. Put the the lid on the filter. Once the well is empty, remove the filter. Coffee is ready. I once told my husband, "If you cut me open, I'll bleed milk tea." He asked, "Why are you so morbid?" I don't know. At the time, it was the only way to accurately express my love for milk tea. What can I say? The love is real and strong. Lately, I have a thing for grass jelly in my milk tea. Milk tea and grass jelly with a cream top and a sprinkle of sea salt? Oh God. Yes, please! I rarely drink Starbucks, but when there's Starbucks Frappuccino Happy Hour that comes once a year, "venti white chocolate mocha frappuccino with extra whip, please!" It's sugary, high-calorie frappuccino literally everyday for the whole week. All self control (and my waistline) goes out the window. Now that the evil (but fabulous) promotion is over, it's time to detox with a healthy alternative and a summer time favorite: Vietnamese Avocado Milk Shake or Sinh Tố Bơ. Boba, boba milk tea, bubble tea, pearl milk tea, ... whatever you call it, it is a popular Taiwan-originated drink that I simply can't get enough of. In college, I usually rewarded myself after a successful exam with boba milk tea. I also consoled myself after an exam with boba milk tea. If you like boba as much as I do, we can be best friends. Have you ever had egg in your coffee? That's just insane ... or ingenious? If you are having coffee in the morning, why not slurp down breakfast as well? Vietnamese Egg coffee, or Ca Phe Trung or Cafe Trung, is a Northern Vietnamese drink. Vietnamese iced milk coffee (Ca phe Sua Da) is the most popular coffee drink in Vietnam. It’s a refreshing dark roast coffee drink sweetened with condensed milk; poured over ice. My garden has been exploding with mint and strawberry this year. This drink is the perfect way to use them all up and keep cool during the hot Summer days.